YOUR PRIVATE PARADISE... GET AWAY FROM IT ALL, WITHOUT GIVING IT ALL UP. Enjoy Rainbow Tree - as so many others have done, time and time again. Wash away your stress in ambiance conducive to quiet romance. Recharge yourself. Luxuriate in a tropical climate with cool sea breezes in the driest part of Jamaica. Rainbow Tree is an award-winning, custom-designed, and custom-built villa. It is situated on the most beautiful property in Treasure Beach - five and a half very private acres directly on the Caribbean Sea. It provides a private haven for vacationers who seek an out-of-the-ordinary retreat from workday hassles. your accommodations are gracious, spacious, functional, and beautifully decorated. There are nearly 7000 covered square feet to enjoy, both inside and on the covered verandah that encircles the home. Ceilings are 17-foot cathedrals, with overhead paddle fans throughout. There are two master bedroom suites with king-size beds plus three more bedrooms, each with two twin beds that can be made into kings. All bedrooms are air-conditioned, though the delightful breezes usually make their use unnecessary. Walk-in closets, four large bathrooms, and a powder room enhance your comfort. The expansive living room extends 30 feet along the sea side of the villa. The separate dining room seats up to ten. A breakfast bar complements the kitchen. Books abound in the greeting room/study. Rainbow Tree has High-Speed Wireless Internet access, TV with a DVD , and a good sound system. There is wheelchair access to the entire villa. There is a beautiful cactus garden on the mountain side of the villa - a wonderful place to sit with your morning coffee and watch the hummingbirds. Your staff of three full-time and two part-time professionals will do their utmost to make you comfortable and turn your vacation into an experience you’ll want to repeat again and again. However, your privacy is absolutely respected at all times. You will awaken to fresh-squeezed orange juice and the aroma of just-roasted Jamaican mountain coffee. The staff will select the finest fruit, vegetables, fish and lobster; prepare three meals a day; clean; handle your laundry needs; maintain the grounds; and keep the sparking pool crystal clear. Loving nanny child service is available at a moment’s notice - at nominal cost. You can virtually live on Rainbow Tree’s huge, covered verandah. And, you need only walk a few feet from the veranda to Rainbow Tree’s lovely pool, complete with thatched gazebos. A wide, sandy, reef-protected beach runs along the entire property line. The sea is a snorkeler’s dream and beckons to swimmers. Comfortable airport transfers and private guided tours of a host of delightful area attractions are available. Particularly large parties can rent Rainbow Tree in conjunction with Rainbow Point, our other Treasure Beach villa. Our staff members are used to working in concert and can serve special meals or dinners together for your combined group. We are “island people,” having lived in the Caribbean—and having traveled extensively throughout the Caribbean and Pacific. We moved back to the US from St. Croix in 1980, realizing we needed a more stable environment in which to raise and educate our children. (Karen concentrated on technology and healthcare marketing, and Peter worked in sales and customer service.) We found Treasure Beach when we were searching for a sweet and unspoiled place in the Caribbean to visit—and first stayed there in 1985. We immediately fell in love with the people, returning as often as we could. We purchased 5-1/2 beachfront acres in 1988, designed Rainbow Tree, and had it carefully constructed from 1989-1991. (Because we lived in the Caribbean, we understood the special design and construction considerations.) Our staff has been with us since 1990. We have become an integral part of the community and regard Treasure Beach as our second home. Karen heads Treasure Beach Foundation, a nonprofit devoted to providing educational opportunities for the students of Treasure Beach. Treasure Beach is well outside the hustle and bustle of the tourist areas of Jamaica. The residents are decent and hardworking—and they call tourists “guests.” Treasure Beach has a casual, laid-back feel. When we had the opportunity to purchase 5-1/2 acres—what we thought was the finest land in the area—we jumped at the chance. We have had a relationship with our employees for 20+ years; they delight at making our guests feel as comfortable as possible—and are largely responsible for our exceptionally high rate of return guests and referrals. Our land extends from the road to the beach. The villa itself is superbly designed and constructed. There are 17-foot cathedral ceilings throughout, keeping it airy and cool. All rooms and closets are oversized. The living room alone is 30 feet long and has several seating areas. All bedrooms have cross ventilation, and A/C is available in each; all mattresses are custom-made to hotel standards. 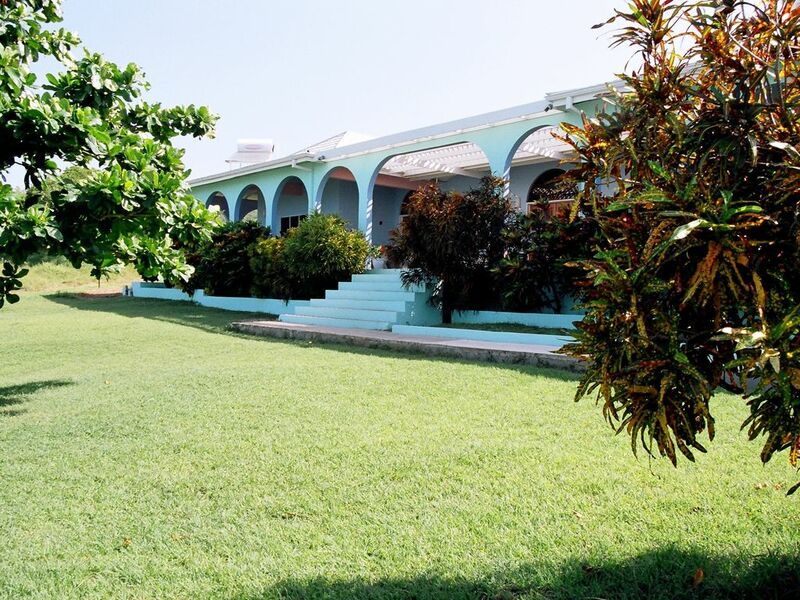 The villa is full of original Jamaican art and photography. Large verandahs surround the house, providing numerous areas to relax. The 30 foot freshwater pool has a large deck, a gazebo, and two sun shelters. We recently added an outside kitchen in which the staff prepares amazing Jamaican meals including jerk chicken and pork. The sound system has speakers inside and outside; wi-fi is there if you care to keep in touch with the outside world. Our villas manager is available to take you on delightful day trips. Loving, responsible nanny service can easily be provided. Staff will handle your laundry needs. With an additional outside Kitchen for grilling, etc. Plays through DVD player. No TV programs. Local fishermen available for boat tours. Crystal clear 30 foot fresh water swimming pool. Numerous fascinating day trips by boat and vehicle, A superb staff that loves to share their Jamaica with you, will make you want to return again and again. Masseuse available to come to the villa.